Stories and photos from my travels around the world. Take the Plane to the Game, and then walk the rest of the way! In early April, I was able to fly up from DC for the day to watch a New York Mets baseball game at Citi Field in Queens. While the performance on the field from the 2015 National League Champions was lackluster at best, I discovered something amazing on my whirlwind baseball trip: there is an easy to find, well marked walking path from Laguardia Airport to Citi Field. The walk only takes 20 minutes and lets you breeze by the constant gridlock after a game and at the airport! The Flushing Bay Promenade is a 1.5 mile paved walkway that connects LaGuardia Airport to the World's Fair Marina, and then right to Citi Field. To find it, you need to make your way to the Delta Terminal (that is Terminal B to non-New Yorkers) and exit the building on the lower departures level. After walking along the approach roadway to the terminal for about 200 feet, you will find the promenade. From there, it is an easy walk (follow the throngs of Mets fans parking and under the highway for free) right to the stadium. 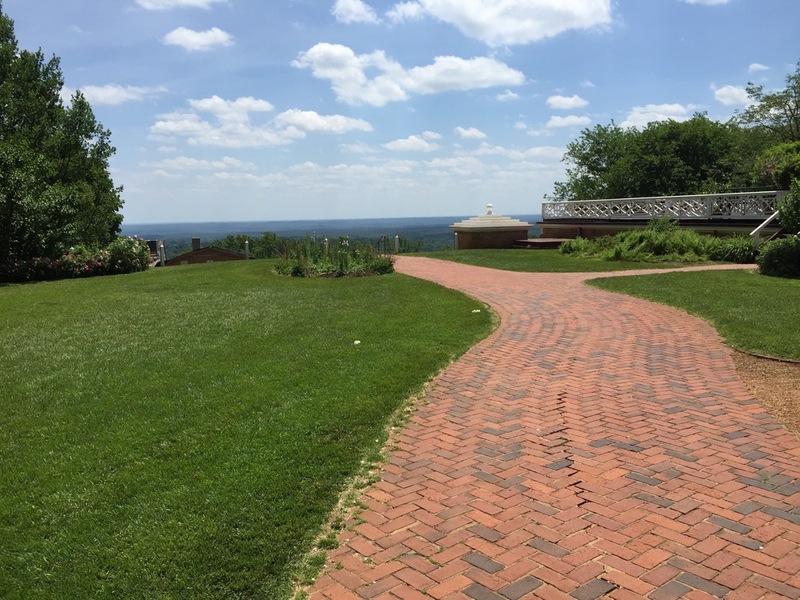 The pathway itself is lovely, and provides great views of airplanes landing and taking off at the airport as well as all the traffic on the Grand Central Parkway that you are defeating by walking to the game! On the Sunday afternoon I used it to get back to the airport, there were plenty of families out enjoying the day as well as some other Mets fans heading home. While it was cold (it was the first weekend of the baseball season) the walk was easy, fast, and let me save 15-20 dollars to get back from the game. Overall, this trail lets you save at least 30 dollars on ground transportation when going to a game, and gives you just enough exercise to justify that Nathan's Hot Dog as well a helmet sundae! It also may be a way to reach public transit from LGA when traveling light! Since I began traveling with any regularity, I have been on a quest: A quest to find the perfect suitcase to carry my stuff on my travels around the world. My luggage criteria is simple. I want a bag that isn't too big, but also not too small, and will let me bring multiple days worth of clothing easily in all seasons (that means sweaters and/or shorts). Because most of my flights and other travels are for longish weekends, I also want a bag that is easy to carry, and will fit (for the most part) either underneath the seat in front of me, or easily in the overhead of all the types of planes I fly on. This is important because for the most part, my travels are on Regional Jets (like those pictured below) where luggage storage can be limited. Another consideration is that in many cases, I will be traveling from work to go on these trips, so I need a bag that I can easily take with me on public transit, and not be a jerk. I also want this bag the be THE bag I take with me, which means it has to also be able to carry a laptop and/or at the very least my iPad and camera gear. And not be too heavy. I've been through garment bags, duffels, expanding bags, backpacks, totes, and many, many, many roller bags, but have only recently found a bag that I truly can say is the perfect bag for me! The bag that currently has become "THE Bag", the Water Repellant Polyester Boston Bag Large: $79.95 (available online at muji.us), (no idea why it is named after a New England city, maybe its flexibility lets you cheat at football??) is the most versatile travel bag I've ever owned. I found this bag by chance on a trip to New York City a year or so ago while exploring the newly opened New York location of the Japanese Department Store Muji. This store, known for its low cost, high quality homegoods (and amazing socks, I love their socks) also sells some amazing travel goods, including a variety of kinds of luggage (including those European sized (so tiny) wheely bags). The Boston bag's main appeal is its flexibility (it can fit lots of things) and built in organization. This includes six pockets, including two inner pockets great for use in segregating dirty clothing from those that are clean. The pockets are also great for quickly putting my keys, wallet, watch, and iPhone away when going through security, and then finding them again! The build quality is excellent, and the zippers are well constructed. The material, while synthetic is is very durable, and has taken some beatings without quitting while traveling. It also has a very durable shoulder strap, which allows me to carry it easily, no matter the load. Since the bag's material is waterproof it has been great for winter travel, keeping my stuff dry especially when I have to deal with the Thunderdome that is Gate 35A at Washington National Airport and go outside to board a plane. On board planes, it fits really well underneath the seat in front of you on all tiny planes including the two pictured on the right. Since it is carry-on sized and has an open pocket at the back you could also bring it with you on longer trips as a second bag and attach it to the handle of a wheely bag easily while maneuvering through the airport. The pockets also are helpful here since you can reach things like headphones or other wires easily without digging through the bag for them (and accidentally dropping your underoos in the middle of the aisle. I find that for all but the longest of trips (more than one week) I can get away with it. Of course, this requires strategic packing, but then again all travel does! Also the simple, clean design of the bag makes it look very professional in a way that I would recommend this bag as the bag for business travel. Of course, the Boston Bag would not be a great bag to use if you're bringing a suit jacket (and don't want to wear it on the plane) nor if you have to bring a briefcase with you while traveling. In those cases, you may want to look elsewhere. I have traveled with this bag and my work bag, and it can be awkward to have two different bags on your shoulders. Muji also supplied me with my travel toiletry bag, the Paraglider Cloth Hanging Travel Case, Large: $20.00 (available online at muji.us) (again, I only buy them, I don't name them) which coupled with the Boston Bag are the best travel gear I've owned. This little bag carries so many different things I may need under 3.3 fluid ounces (or 100 milliliters, for those of us who understand SI units) without being bulky or taking up too much room in my bag. It is much better than using a Ziploc bag or the like, and the built in hanger makes keeping things organized and dry when counter space is in short supply in hotel bathrooms. It too is made of a strong but light nylon which can be washed easily if there's spills. The bottom line is that this bag is great for my needs as it helps me carry my stuff during leisure travel on weekends easily. It's durability and flexibility, coupled with a very affordable price makes the Boston Bag a no nonsense, easy to use travel bag. When I do however have longer travel, I do regress to using a wheeled bag. The quest though for a bag for longer travel though continues...that's a whole other post! Birthday, Bahamas, and Baseball: 2016 In Travel Begins! After a long winter slumber, Travel Matt begins another year of travel this week! My 2016 travels begin with a whirlwind trip to South Florida to see Spring Training Baseball, and go to Nassau, The Bahamas for the day! This trip, which was enabled by a number of opportunities/deals lining up nicely, is a three-day action-packed adventure to see the New York Mets, eat Cuban food in Little Havana, and spend the day on Cable Beach in Nassau with an awesome person and her family (who are also awesome as well). Lots of travel in a short time! But totally worth it! Originally, I had planned this week (potentially) going on a week-long cruise out of Baltimore this week, but unfortunately this plan did not work out. I still however wanted to do something travel-related, and after some strategic use of Google Flights (so much better than Kayak) and a number of birthday related coupons and rental car/hotel miles, I was able to plan a trip where I am able to meet up with my lady friend and her family (who are on that cruise) in Nassau while they are in port, and see the New York Mets in Port Saint Lucie, Florida the next. Now you would think a trip like this would be crazy expensive, but because of a number of Hilton hotel miles, Hertz rental car miles, Stubhub Rewards points, and a coupon for the resort I'm staying at in the Bahamas overnight, I was able to keep the costs for this trip down to my airline tickets and the cost of the hotel in the Bahamas (which is all-inclusive, whatever that means). I love a good travel deal and am excited that this deal worked out in my favor! I'll then get up very early and return to the Miami International Airport to catch a quick international flight to Nassau, The Bahamas, to stay at the Meliá Nassau Beach Resort, located on Cable Beach. My lady friend and her family were able to get Day Passes to the resort to spend the day with me at the resort. I've been to Nassau before, but stayed last time (a very long time ago) on Paradise Island, so I'm excited to spend the day at a different part of the island pool and oceanside on what is apparently one of the best beaches in the world. Apparently the beach also is great for snorkeling as well, which is always awesome. Expect lots of photos from my day there! After a day in another country, I'll fly back early the next day to Miami, where I have a nine hour layover before returning home to DC. During that time I'll drive up for the day to Port Saint Lucie, Florida, the winter home of the 2015 National League Champion New York Mets to see their first Spring Training home game. While the drive is a little long, I will have plenty of time to get to and fro the game using a free rental car that I was able to get using some of my Hertz Gold Plus Rewards points I've accrued being the official driver of my family on vacations. If you're interested in following my trip (which I admit is crazy, but awesome), check out my Instagram Account (@mattcarnavos), Twitter (@mattcarnavos) or this blog for updates and photos! Author's note: After a long hibernation this site is back. It has been a very very busy year of travel, including a trip to California, many trips to Florida, and a visit to Amsterdam and Paris. More content and photos are coming soon! I promise!! 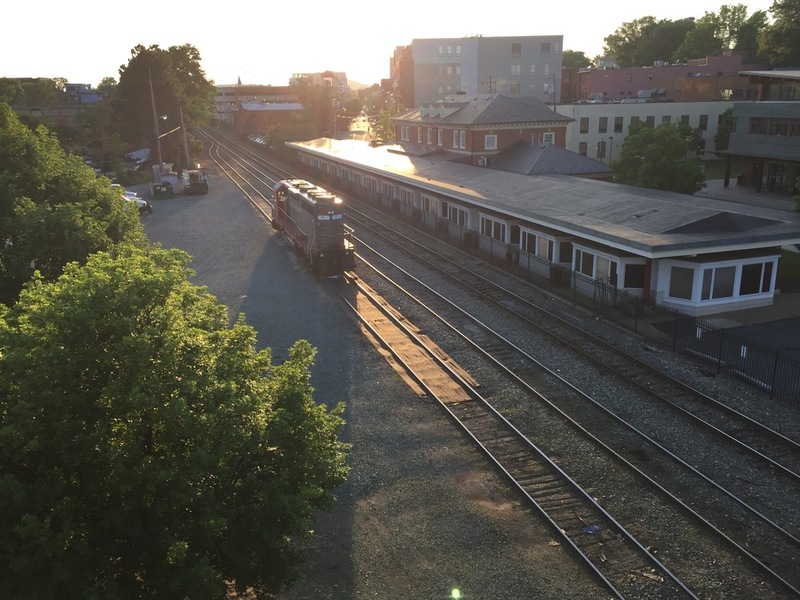 Last May, I took a long weekend trip out to Charlottesville, Virginia. 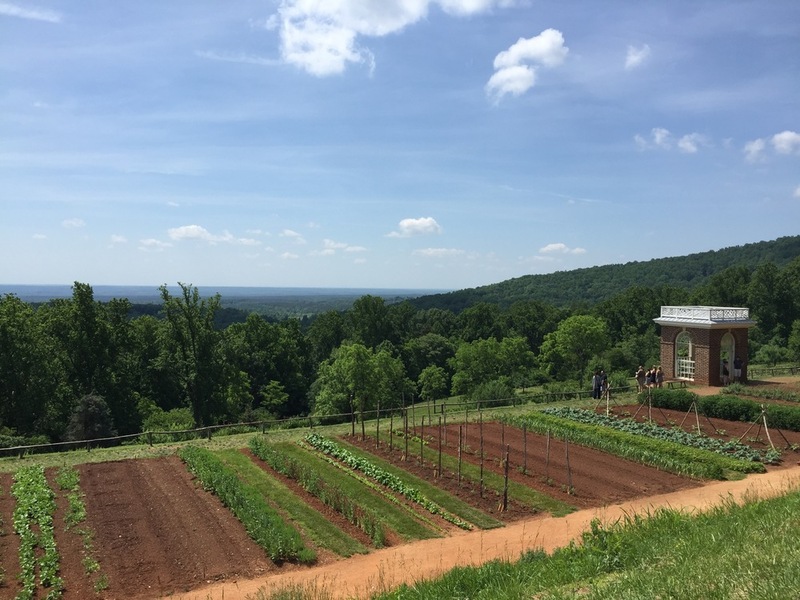 This city in central Virginia is the home of the University of Virginia and all things Thomas Jefferson, including his self-designed home, Monticello. It is also in the heart of the Virginia Wine Country, which makes it a tasty place to visit as well. The wine was great, but the view was also amazing. 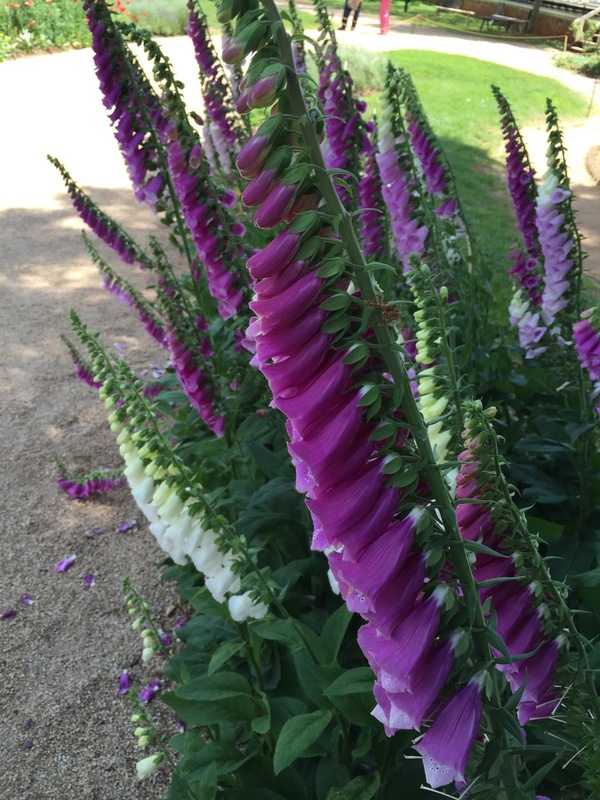 Below are some of the photos I took during our winery tour as well as in and around Charlottesville. Well hello! A week and change later I'm back in DC after my amazing trip to Patagonia, and it is now time to share some more photos, including the highly anticipated photos from my visits to three penguin colonies. 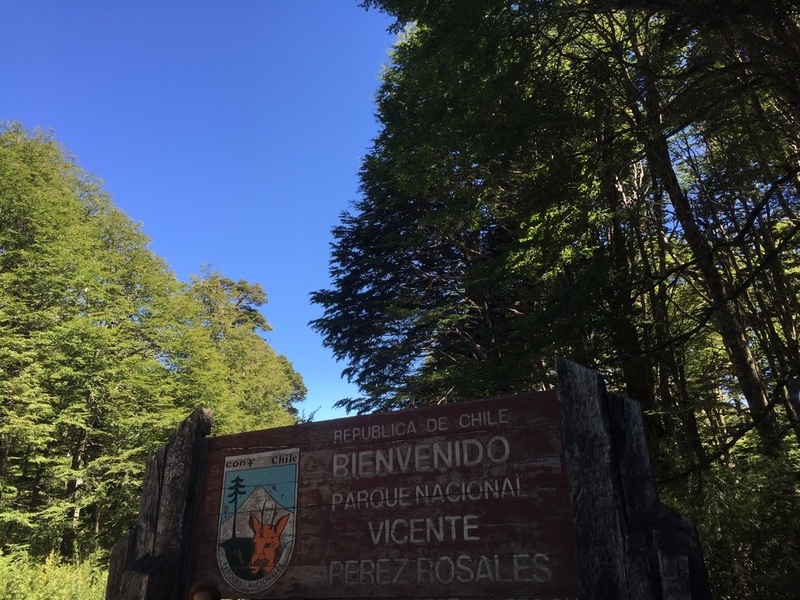 While in Punta Arenas, Chile I visited the Seno Otway and the Monumento Natural los Pingüinos. 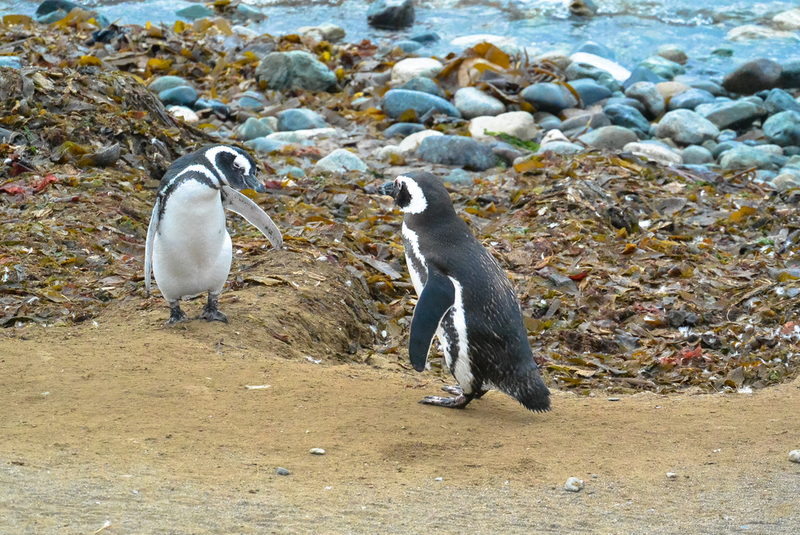 At both of these colonies, I saw hundreds, if not thousands of Magellanic Penguin who were nested at the colonies for the summer mating season. Yes, that meant there were baby penguins. In Ushuaia, Argentina I visited the colony located on Isla Martillo. 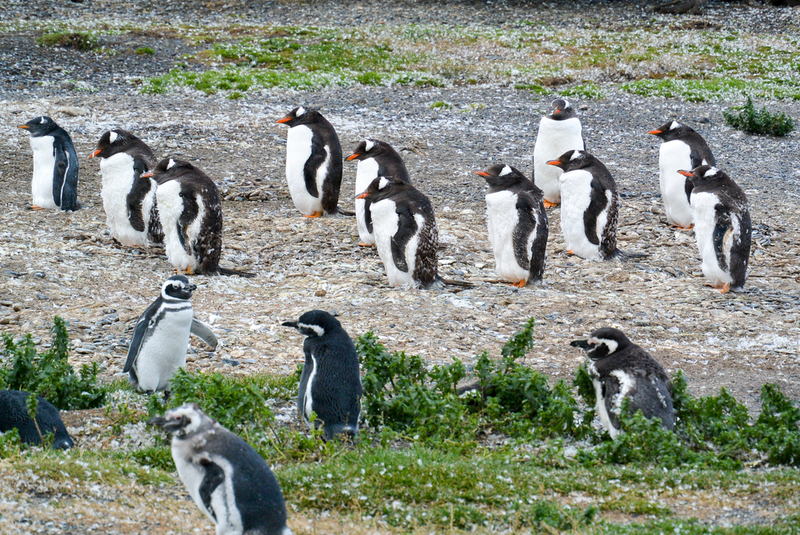 At this colony I saw Magellanic Penguins as well as both Gentoo Penguins and breeding pair of King Penguins, which are the second largest species of penguin in the world. They are quite large! Overall it was amazing to see these penguins in the wild, watching them swim, build nests, and stand at attention over their eggs. I was able at all the colonies to get extremely close to the penguins, so close that the photos I took are more amazing than I even expected them to be! 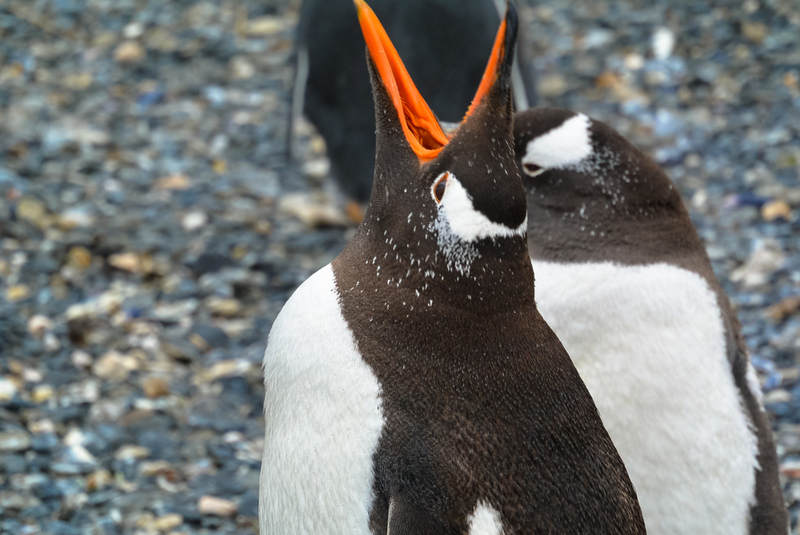 Below is a sample of some of the photos I took of penguins during my trip. You can also view the full gallery in the Penguin Photos Gallery under MattPhotos. Enjoy! Hello from Los Glaciares National Park, home to the Perito Moreno Glacier. 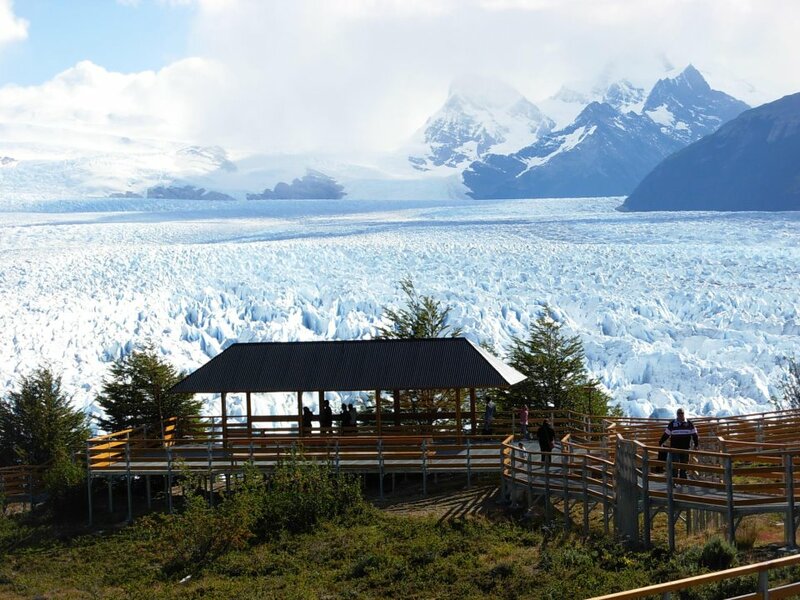 This national park, located on the border of Chile, is home to several famous glaciers, including the afformentioned Perito Moreno. Crossing the steppe to El Calafate. I arrived back into Argentina yesterday afternoon from Chile to the city of El Calafate, located on the high arid steppe of Patagonia. This means that typically it never really rains in El Calafate (the average precipitation here is akin to San Diego); however it sure did yesterday afternoon and night. Downtown El Calafate, the town a glacier built. it's actually named for a type of blueberry. The town somewhat of a boom town in that the infrastructure here has really only come into existence in the past 10 years. While this means that everything is more expensive than it needs to be, it also means that getting to see the glaciers was extremely easy today. It helps that Argentina's current president comes from here and has significant ties to the tourism industry here. We began the day early, heading out approximately 25 kilometers from the town, and passed through more arid steppe until we reached the Magelenic Forest as we approached the Andes. The land became greener, and after a short while the Perito Moreno Glacier came into view. After entering the park (which costs more than a movie in Manhattan, but whatever) we immediate bordered a boat, crossing Lago Argentina to reach the south face of the glacier where I was confronted with a sheer wall of blue and white ice, over 60 meters high, nearly 14 kilometers long, and at its widest point 5 kilometers wide! All the while, thunder like sounds echoed through the lake as pieces big and small of ice broke off the main glacier, falling spectacularly into the wintergreen blue colored lake below. While I thought the boat ride would be the highlight of the day, the real treat came when I was able to hike alongside the glacier! When the glacier formed, it covered an entire corner and branch of the lake. As it melted, a narrow channel formed between the glacier on one side and a hill opposite it. The national park contains a series of walkways (catwalk like pathways of stairs and ramps) that allow you to get as close to the glacier as possible. This allowed for more amazing photo opportunities as well as for viewing and hearing more thunderous ice shearing off the glacier's face. Overall this was an amazing experience and a great reason to take the northern detour to El Calafate on my way to Ushuaia. While I could do without the extreme tourism (everything is so much more expensive here than on the rest of my trip has been and they are probably more try to take your photo for money people here than on Main Street, USA), the glacier is something not to be missed! Expect a bigger album of photos from the glacier when I arrive home after my trip. Next stop, the End of the Earth!! Greetings from Puerto Natales, Chile! This small town located 250 kilometers from Punta Arenas is located on a fjord of the Pacifc Ocean. It reminds me a lot of Seaside, Oregon or really any of the towns I've been to in the Pacific Northwest coast. Even down to the earthquake and tsunami warning signs. I guess we could call it the Pacific Southwest? It's been an amazing couple of days traveling across Chilean Patagonia. I've seen penguins and penguins, glaciers, mountains that scrape the sky and are covered in snow, and a whole bunch of other amazing sights too difficult to explain with words. I've also learned that outside of eating, visiting Chile for fun means you're charged for hotels, etc. tax free and in good old U.S. Dollars. Freedom isn't free, but I enjoy using my $1.25 to pay for it in this country. I also experienced a nine hour delay getting from Puerto Montt to Punta Arenas thanks to engine problems on the plane. They did however compensate me for my time, and I was actually able to sleep in the airport, so the next day in Punta Arenas wasn't a total loss. 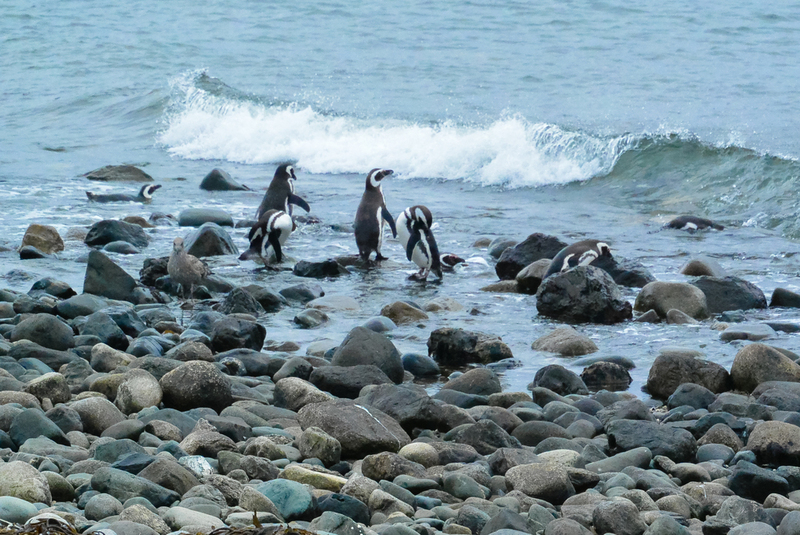 While I'll focus on penguins in Punta Arenas in a separate post, in this post I wanted to talk about what I did today, a whirlwind ten-hour tour of the Torres de Paines National Park. We covered a lot of ground in that time, but the trip was amazing. There's been several times in my life I've thought to myself I'm visiting something special, something unique and singular. This was one of those days. We began the day with a whole lot of geology and visited Milodon Cave. This cave, known primarily for the location of the discovery of a prehistoric giant bear like sloth, named the milodon, was formed through the erosion of a mountain by a prehistoric lake. The lake eroded the "soft" rock between two hard rock parts, forming a wide yet somewhat shallow cave. As an aside, the fossils found in the cave however have made their way to two museums I've been, however, the Royal Natural History museum in London and my all time favorite museum — the greatest museum in the world, home of the Big Blue Whale in the Hall of Oceans, and the best dinosaur fossils ever— the American Natural History Museum in New York. When we arrived, we were immediately greated with a beautiful view of the Torres de Paine. These three jagged rock formations soar into the sky from nearly sea level alongside snowcovered mountains to form the park's iconic image in front of a blue-green lake. The weather behaved well today, as if it had been a bit cloudier our view of them would have been obstructed. Although in Patagonia, wait five minutes and the season changes. We then ventured further into the park, driving on unpaved and narrow roads, all the while surrounded by amazing landscapes. After a short while, we came to a stop on the road. Our guide pointed out a flock of condors sitting on a easily reachable hill only a few hundred yards away. We all got out of the van, cameras in hand, and walked up to the top of a hill to view the condors up close. What I witnessed was truly magical. Seven or eight condors first resting, then soaring above, below (down in the valley on the other side of the hill) and around us! They were so close I snapped some amazing photos of them using my "real" camera. I'll post these when I return home. We also had close up encounters with several guanaco, an animal that looks sort of like a cross between a camel and a llama, and ostriches. After going further along the park we stopped at the Salto Grande waterfall. This waterfall, formed as the glaciers receded, links two lakes in the park at different elevations, and has the characteristic wintergreen color caused by sediment from glaciers. It was pretty amazing and provided many opportunities for photos as well as a gorgeous foreground for more photos of the landscape. After a stop for lunch (a grilled steak meal was included in this tour's cost) we headed for the Grey Lake and the Grey Glacier. This glacier, which was unfortunately 17 kilometers away from us at the other end of this massive glacial lake, yields amazing ice flows and icebergs that when viewed appear to be blue in color. Additionally to reach the lake required a hike through the forest and over a fast moving river bring glacial melt through the park and eventually out into the Pacific Ocean. I wish we could have spent more time here and take the boat ride to the glacier itself, but that will come on Saturday, in Argentina, when I visit the Perito Moreno Glacier. Gelogically, they are part of the same formation. Overall this tour was excellent and provided me with amazing photo opportunities and viewing of amazing landscapes and wildlife. I think that if I were to come to the park again (and I would love to do so one day) I might make it my primary destination and do much more hiking and maybe even stay overnight at one of the lodges located there. Maybe in 9 years...I feel like that could be a good future I don't want to think about that birthday trip. I crossed the Andes! And it was less difficult than in The Mission. Look it up, great film. Also today was one of those days I wish I was a geoscientist, although readers out there who are, you're in for a treat! My journey was on the Cruce Andino, a route that combines bus and boat travel across the Andes to Chile from Argentina. On board boat number one heading west towards The Andes and Chile. We started out day very early in Bariloche. After a short bus ride to Puerto Pañuelo, we boarded a fast catamaran to cross Lake Nahuel Huapi. During the crossing the Andes grew closer and closer as we went further west. The water became greener, changing from the dark blue color at the shores of Bariloche. The change in color of the water was quite dramatic, happening almost instantly. After reaching Puerto Blest, we boarded a bus for a short portage (I'm literally using that word right here) to the banks of the Lago Frías (which if you remember from yesterday has a milky wintergreen appearance because of the sediment in the glacial runoff from the black glacier). On arrival we boarded a boat to cross the lake and arrived at us the Argentine Border. At this point we were 700 meters above sea level (and at this point the sea in question was still the Atlantic). Boat number two across Lago Frías. After a somewhat confusing process to get out of Argentina (seriously I want to work on the translations they say on this tour into English for them sometimes), we boarded what amounted to a off road bus and climed into the Andes and towards the Chilean border. After what looked like a segment of driving from a Top Gear Christmas Special, we reached the high point of our journey and the Chilean border— 1,000 meters above sea level—and crossed the Continental Divide. While the Argentine border control is in the lake shore, the actual Argentina-Chile border is marked by this simple wooden frame. The Chilean border control is actually nowhere near this but a half hour down the mountains in Puella. Our driver then continued our journey into Chile and through the Andes, negotiating crazy turns and sharp corners. Pretty much crazy driving. We then reached our next stop Puella, which is where we cleared Chilean customs, and had lunch. It was the definition of a tourist trap as you can only get there and leave on a tour. Our off road bus across the Andes. The guy driving this was a pro. After lunch, we headed by boat across lake name, known for its emerald color. As we crossed the lake, two volcanoes came into view, one of which, Volcano Osorno, is active! It apparently erupted as recently as in the past few years. On board boat number three, and deep into Chile. This was the first volcano we saw, and it had eroded into this jagged peak like appearance. After we landed in Petrohué, I was treated to an amazing volcanic landscape! This town, located literally on the base of Osorno, is covered still in volcanic dust, which brings me to the last sight we saw, a lava waterfall! This waterfall was formed after an ancient eruption of lava reached a river that flows to the Pacific Ocean (yup, I've crossed a continent). This has lead to some interesting lava tubes and other awesome volcanic formations. We didn't have that much time there, but what I saw was amazing! All that volcanic dust in Petrohué! To end the trip, we drove along Another lake, the largest in Chile entirely and one of the largest in South America, to Puerto Varas, where I am today before my flight to Punta Arenas, and the bottom of the earth! It was a full day of travel and we didn't get to Puerto Varas until after 8:00 pm. Overall the Cruce Andino was an excellent experience and something that if you're ever down here you must do. Also interestingly enough Puerto Varas is directly due south of Long Island where I grew up. So if you're ever asked what is south of suburban New York, a correct answer would be an active volcano and the Pacific Ocean! Amazing. Matt Note: I composed most of this while on a tour today of Mount Tronador and the black glacier outside Bariloche. I'll be posting a gallery of more photos when I'm back at home in the U.S, but here's some highlights and description of the trip. Even with a selfie stick and a remote shutter, this self portrait thing is a mess. Hopefully I'll get the hand of it by Ushuaia. Hello from the base of Mount Tronador and the black glacier. This mountain, a long dormant volcano, is named for the sound that cleaving ice makes when breaking off the main glacier is today's destination. The name "black glacier" comes from when the ice begins to fall down the mountain and mixes with volcanic rock. One of several glacial lakes in this area. I'll be crossing several by boat tomorrow! After leaving Bariloche (albeit a little late) we headed up and out of the city into a national park. We left the highway and traveled on gravel and dirt roads and over wooden bridges on our way towards the mountain. Along the way we stopped at crystal clear mountain lakes and rivers carrying glacial melt into them. All and all lots of amazing photos were taken. Yeah, I can't believe I was here too. When we reached the base of the mountain we stopped at a camp run by Eastern Eurpoean immigrants for lunch. I had the best strudel I've had outside of Germany for dessert! A reminder, I'm in Argentina. I also went on a half mile hike along the river to view a waterfall made of glacial melt from high above on Mount Tronador. All of this was before 2:00 pm! Hiking up to see glacial waterfalls. We then left the base camp and headed further around the park to the glacier. When we arrived, I was greeted with an amazing view. Perfect white ice and snow towards the top of the mountain valley contrasting with the ice and volcanic dirt of the glacier lower in the valley. At the base was a wintergreen colored lagoon full of pieces of glacier that had fallen off. All the while I heard the thunder-like sounds of glacier breaking and tumbling town the valley. There were three avalanches during my visit. Pretty awesome stuff. The Black Glacier and its melt lagoon. 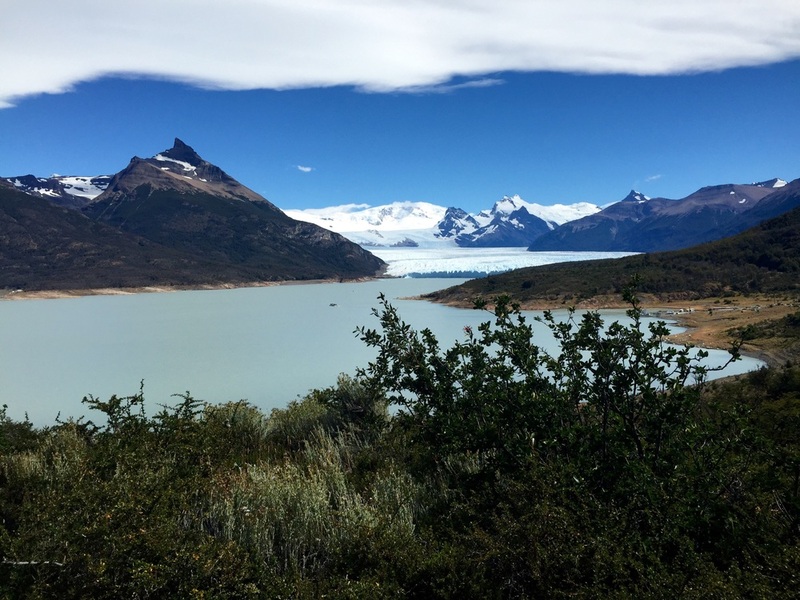 Overall I'd recommend this tour; while we spent a lot of time on a bus to get places, there really is no other way to explore this vast and beautiful Patagonian National Park. And as an aside, I was impressed with my comprehension of Spanish descriptions of nature as for the most part the tour was en Español! Now we're headed back into Bariloche, where I plan on pretending I'm in Germany or Switzerland and have an Alpine Evening...in South America. Chile tomorrow. Remind me what continent I'm on again? So greetings from Bariloche, the heart of the Argentine lakes district at the foot of the Andes. Also the beginning of my adventures in Patagonia. While I wait for my tour (which is late) to arrive at my hotel, I figured I'd give an update of my trip here yesterday evening. Flying out of Buenos Aires other airport Aeroparque was a delight. However because of labor action (not sure if there or here in Bariloche) my flight was delayed for two hours. It did afford me to have what arguably was the best airport meal I have ever had: barbecued beef/pork kabobs. Fantastic. After that lengthy delay I went through the semi-nonexistent airport security and into the very tiny terminal. For an airport so tiny they had flights going to every corner of this vast country and even to Chile, Brazil, and Uruguay! 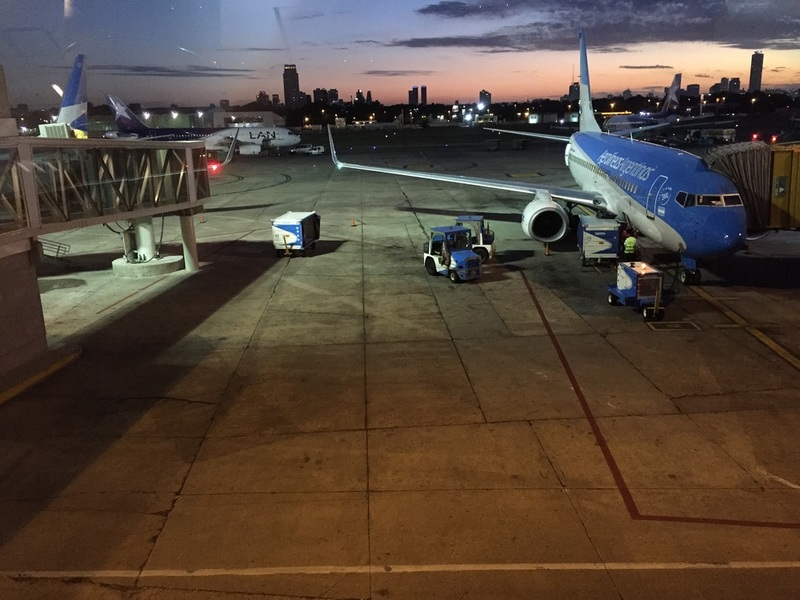 Aeroparque, the smaller yer busier airport much more centrally located in Buenos Aires. Remind you of anywhere? When we finally bordered we actually bordered the plane via airstairs. Some might find boarding a full sized plane that way to be a burden, I kinda like it as it feels like old time glamorous flight. Boarding my flight bound for Bariloche. 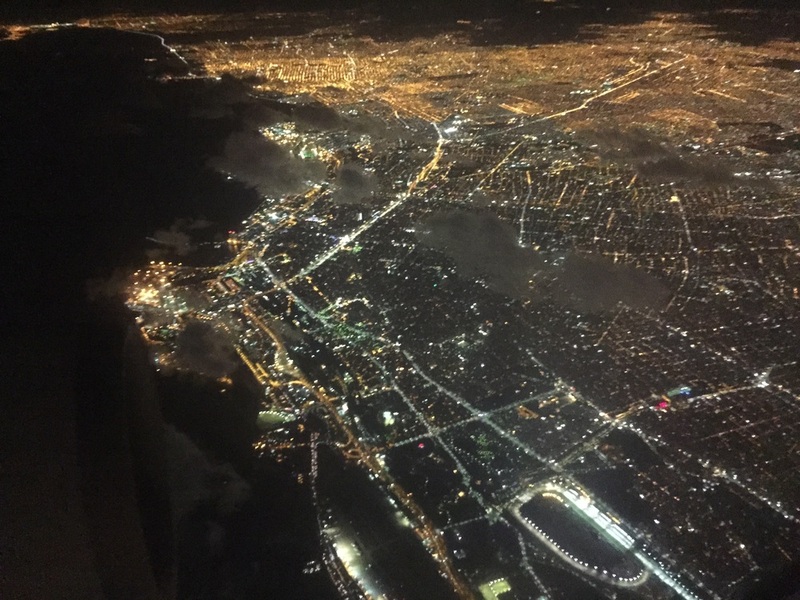 Buenos Aires at night from above. It was pretty spectacular. Although very quickly the lights disappeared as we flew over the very dark and empty countryside. Being so use to flights up and down the east coast of the U.S., sheer darkness was jarring. Although I did get to see the Southern Cross and the stars of the Southern Hemisphere! Two hours and change later we landed at the Barioloche airport, which is tiny. Actually using the word tiny is generous, but getting a cab to town and my lovely hotel from it was easy. So now I'm in Bariloche. Hopefully the tour will arrive soon, if not I have backup plans for the day (always need backup plans on a trip like this) . Check back later for an update on either my trip into the mountains near Bariloche or a trip around town/other sightseeing adventures. Greetings from day two of my trip across Argentina! Before I head out and explore the city, I wanted to write about the excellent food/dinner guided tour (that turned out to be private tour) through the Recoleta neighborhood of Buenos Aires. My tour guide from Urban Adventures not only was very knowledgable about the food and culture of this upscale neighborhood of the city, but was also a great dinner conversation partner. During the tour I sampled several delicious dishes including Argentinian steak, empenadas, and two different desserts. All were delightful. Also we had several interesting conversations about life in Buenos Aires, especially since the debt default, and I learned a lot about the city that wandering alone would have not afforded me. I also got some tips on places to buy some presents, so who knows, you may be getting something when I come back to Buenos Aires at the end of my trip. And finally, we discussed something that had never occurred to me before. Why do we call ourselves (for my U.S. based readers) Americans? I mean Canada and even Argentina are in America (of course Argentina is in South America if you use the seven continent model (I do) of the world). We decided that Englsh is the reason for it. There's really no other way to say that I'm a citizen of the U.S./my nationality without saying I'm American. These are the conversations you only get when interacting with people from outside your country. All and all, it's been a good trip, and it's only beginning! Check back later for an update on my travels from Buenos Aires to the heart of Argentinan lakes country, San Carlos de Bariloche! I enjoy eating...and traveling to do it. In talking to everyone who I know who has gone to Buenos Aires, the one thing they tell me to do while there is to eat, and more specifically to eat steak. While I've had several recommendations for meals, it's always a little weird to eat a fancy meal alone. Additionally, in my short time in the city, I'd like to experience as much of the city as I can, and that includes more than the "traditional" tourist areas/restaurants. After much research, I think I've cracked the code on how to do this: Food Tourism! For the uninitiated, food tourism is exactly what it sounds like, guided tours through a city highlighting local specialties. And in Buenos Ares, there are some great food tours that are also neighborhood based. According to the travel end all and be all website Trip Advisor, Buenos Aires Food Tours seems to fit the bill in what I'm looking for: interesting local food-based tours through both known and off the beaten path neighborhoods and restaurants. Also they schedule their food tours in the mid-afternoon, which is perfect for my schedule both at the beginning and end of my trip! So look forward to some awesome pictures/accounts of my adventures in Buenos Aires food! Coming this time next week! This is an actual true fact! Hopefully I'll be exploring Buenos Ares after a very long flight this time next week. I'm pretty much ready to go! I have a few little things to take care of (such as my itinerary/planned tours and excursions once I get to Ushuaia). Additionally, I can finally see what the weather is going to be like, which will greatly aid in packing. February in Southern Patagonia isn't too different than February in D.C. (well normal D.C., and not subzero D.C we've had this year), but Buenos Ares will be more like early August and Northern Patagonia will be just delightful. One thing that has made this trip much easier to plan thus far was turning some of the logistics over to a local travel agent down in Patagonia. By using a local travel agent however I was able to arrange a variety of busses and airport shuttles to get from my flight to Punta Arenas to the airport in El Calafate, Argentina. After doing plenty of research, I decided to work with South Road, a company that was highly recommended by travelers online who wanted to pre-book busses between a variety of towns (many of which I'm visiting) in Patagonia. 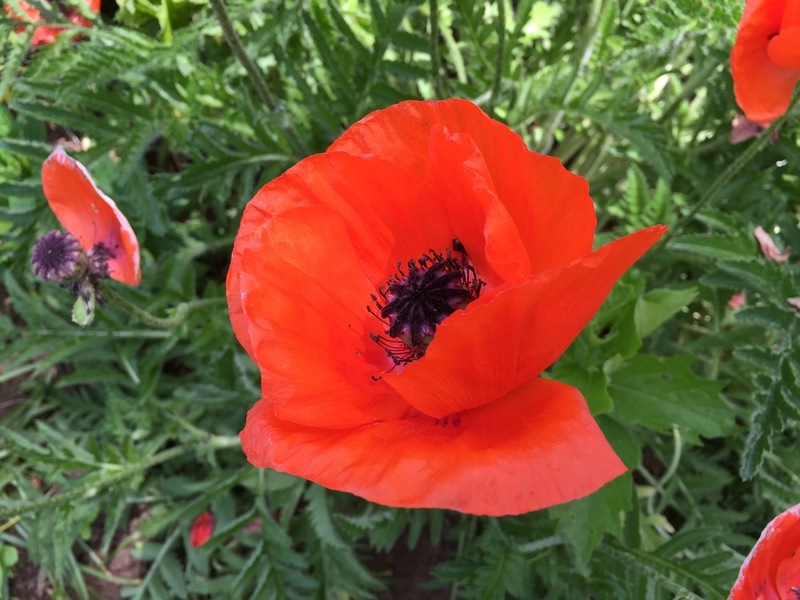 Dealing with them was was incredibly easy and there were no language barriers (many of which I know I would have dealt with if I waited to buy bus tickets until I arrived in Patagonian Chile). I communicated with one of their travel specialists via email who helped arrange logistics for me and was able to pay ahead of time in USD via PayPal. South Road even refunded me back some money immediately they realized that the bus company they were using to get me from Puerto Natales to El Calafate did not charge a specific tax! Overall, the costs of things were not much more than if did everything myself. While the verdict is still out of course if these bookings worked as well as the planning did, but as of now I am very satisfied with their services. It was much easier than trying to figure out how to purchase tickets at the last minute! The company also arranges/organizes tours in Ushuaia, and based on my experiences thus far with them I may use them for future adventures in the Southernmost City in the World! So while I'm planning my next big trip to the Patagonia, I figured I should also put together a post about my last big adventure: Hiking across Northwestern Spain on the Camiño Francés de Santiago. My hiking route through Spain, created using the geolocation of photos I took. In June of 2012, I and a good friend hiked approximately 220 kilometers from Pontferreda to Santiago de Compostela. During our hike on this ancient pilgrimage route we walked through ancient towns, scenic countryside, and mountain valleys (and over some too), on our way to Santiago de Compostela, an city located in Galicia, Spain. Pilgrims of many kinds (religious or otherwise) have walked this route since the 9th Century to the tomb of Saint James, located in the city's Cathedral. Hands down, its one of the best things I've ever done. While I could write lots and lots about this trip, my photos tell much more of the story than my worlds ever could. In the past I've put my photos in a variety of places, but this website provides a great new way to share with them with a whole new audience. So, for the first time ever, the best of my photos from my trip to Spain! Even more plan changes...and how to see glaciers in Argentina. My revised schedule of Adventures in Patagonia, now with more time to sleep. So after making a number of changes to my trip to Argentina/Chile last night, i decided that the schedule I had crafted was, while brilliant, probably in need of one more day of slack. By elimating the falls, I had given myself an extra day in Buenos Ares at the end of my trip (my flight from Ushuaia gets in before noon, my flight to New York on the way back to DC doesn't leave until nearly 10:00 pm that evening). 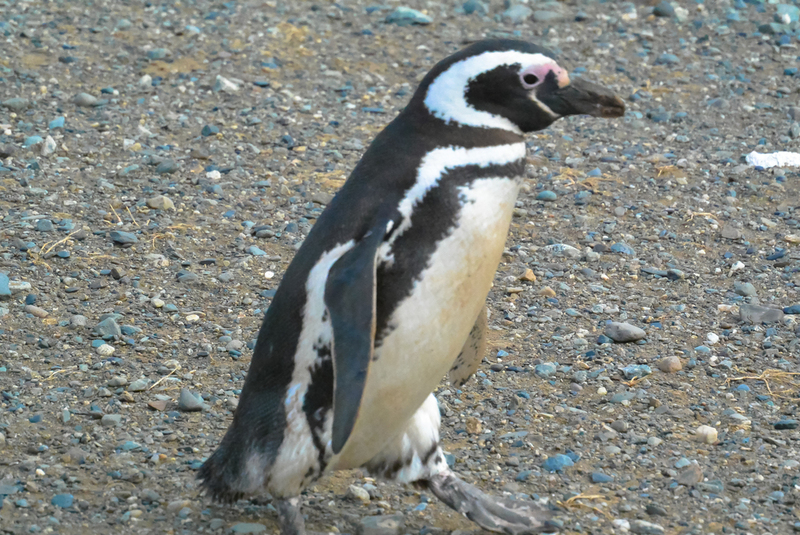 I also had cut my time in Punta Arenas down to the bare minimum, which didn't leave me much time to do much besides see Penguins while there. Considering this, I decided the only course of action is to leave Buenos Ares for San Carlos de Bariloche a day earlier. As I would move everything up a day, this would mean I would get to Punta Arenas a day earlier, leaving myself an extra day in the town to explore as well as more time to find and catch the bus to Puerto Natales. While this means I lose a day exploring Buenos Ares, I think it's the best use of my time. Now my schedule/logistics are locked down, I can begin to lock down the tours I'm going to take while I'm in Patagonia. Normally, I would be all about discovering places throughout my travels on my own, its hard to get to an island full of baby penguins or a glacier by yourself. And while I don't have the travel budget for a fancy multi-day Viking River Cruise-like experience (one day), there are plenty of tours and adventure experiences that won't break the bank available in each of the places I'm visiting. And there's even a website out there that allows me to search them the same way I would search for and buy hotel rooms, Viator.com. This website, which functions like a marketplace for tours around the earth has plenty of options for tours throughout Patagonia for me. For example, maybe while I'm in San Carlos de Bariloche, I'll go on a sightseeing tour around Nahuel Huapi Lake. When I go to El Calafate, I'll take a whole day tour/boat ride to see the Perito Moreno Glacier. There are many other tours I'm considering throughout my trip, and the best part is that Viator will allow me to make all these arrangements at once! Plus they have plenty of reviews from people who have taken the tours so I can figure out which ones will be best for me! This way, I can see the things I want to see, and not have to worry about how to get there! And of course there's an app for that. ave you used Viator.com? Any suggestions on other places to find day tours and make arrangements without breaking the bank? Change of Plans, but probably for the best. So the best laid plans always get always are subject to change. Today while doing some serious Argentina planning I decided that not only did I absolutely want to see the Torres de Paine National Park in Chile, but I also wanted to see the Perito Moreno glacier in Argentina. Both are reasonable close to Punta Arenas, Chile, where I had planned to visit to see penguins and other natural wonders on my way to Ushuaia. I also was finding it logistically crazy to get from Punta Arenas to Ushuaia. There is one bus a day, and the trip takes nearly twelve hours, or really a whole day of my action-packed Patagonian Adventure. Additionally, if I wanted to go to Torres de Paine, I would have to either cut a day out of Ushuaia, or hope that all the buses would be on time through Patagonia. 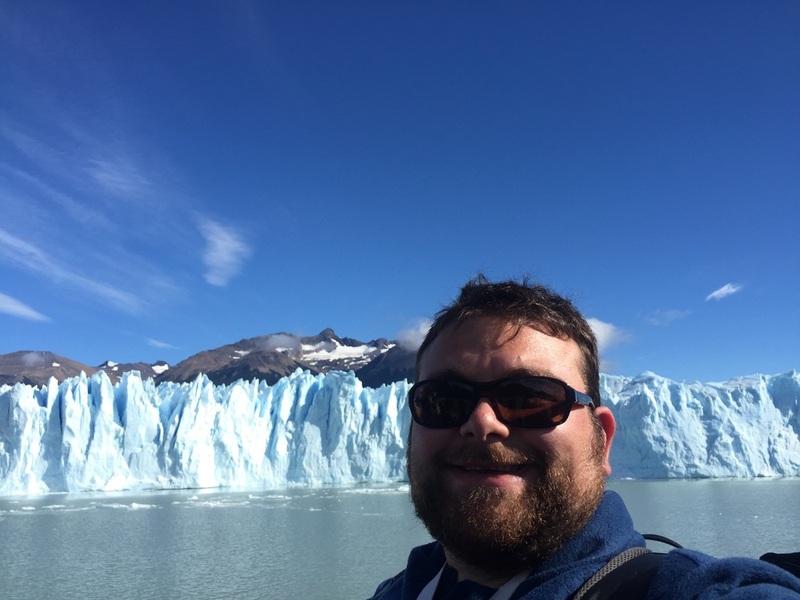 Additionally, while I had planned out my trip to Iguazu Falls for the three days after I returned from Patagonia, I also was a bit concerned that I would have to pack clothing for a completely different climate than the rest of my trip. Plus, because of tight connections in Buenos Ares, I would have little slack between the flight back from the Falls, and the flight back to the U.S. So considering this, I made a decision. I could go along with my original plan and miss out on two sites I absolutely wanted to see, try and do it all and risk doing nothing, or focus my energy on getting to Ushuaia as fast as I could. I decided that I would go with option one, and go to Torres de Paine and Los Glaciares National Park. Plus, the cost of airfare from El Calafate to Ushuaia was less than either a night of hotel at the Falls or the roundtrip airfare. I would also solve the "How to get from Punta Arenas to Ushuaia" problem. Some front of the envelope travel calculations right here. So many moving awesome parts on this trip. PS: If your my parents, there's even more complex machinations at the end of that envelope involving layovers and being a good son. I'll still arrive in Punta Arenas, and stay overnight. Next day, I'll wake up and see Penguins! as well as some of the historical sights in town. That evening (thanks to summer, I'll board a bus to Puerto Natales, located approximately three hours north for two nights. From this town I will go on a bus tour of Torres de Paine National Park (hopefully with some time for hiking). The next day, I'll board another bus and cross back into Argentina to stay in El Calafate for two nights. From this town, located on the shore of Lago Argentino (the largest freshwater lake in Argentina) I'll go to Los Glaciares National Park. Many photos will be taken. I'll then fly the next day to Ushuaia, where I'll then explore Tierra del Fuego until I fly back to Buenos Ares, do some final shopping (wine will be procured) and then later that evening fly back to the U.S. Does it sound crazy. Of course. Amazing, you bet! I have a RSS Feed for you to subscribe to as well. If you're still into such things (long live Google Reader, we hardly knew ye), you can subscribe to a feed for this site at: http://www.seemattsphotos.com/?format=rss. Boom. Now you can see my updates in things like Flipboard or Feedly. I have many photos for you to view. So as I've been building out this website I've added several galleries of photos from my travels since 2007. So far I've added photos from trips to Hong Kong, Scandinavia, the UK, France, Belgium and a few other places around the world. I've also added a gallery of photos I've taken while in flight; this includes pictures of clouds as well as various cities and towns from above, including some great shots of Washington, DC. You can find these photo galleries under the Matt's Photos tab on the top of this page. Enjoy! My route by plane, boat, and bus around Patagonia. On this trip I'm going some amazing sights, epic mountains, crystal clear lakes, and Penguins! Also its summer! Although at the bottom of the earth, that doesn't mean it will be warm! My trip begins in Buenos Ares, where I'll spend a few days exploring as much as this South American capital can offer. I assume I'll be eating some awesome steak as well. I then fly nearly 900 miles southwest to San Carlos de Bariloche, a city located in the foothills of the Andes that looks more like a town out of Germany or Switzerland than South America. While there, I'll be going on at least one or two hikes, eating some local foods, and taking lots and lots of photos. Then things get interesting. I'll be traveling over the Andes by bus, boat, bus, boat, bus, and boat and into Chile. 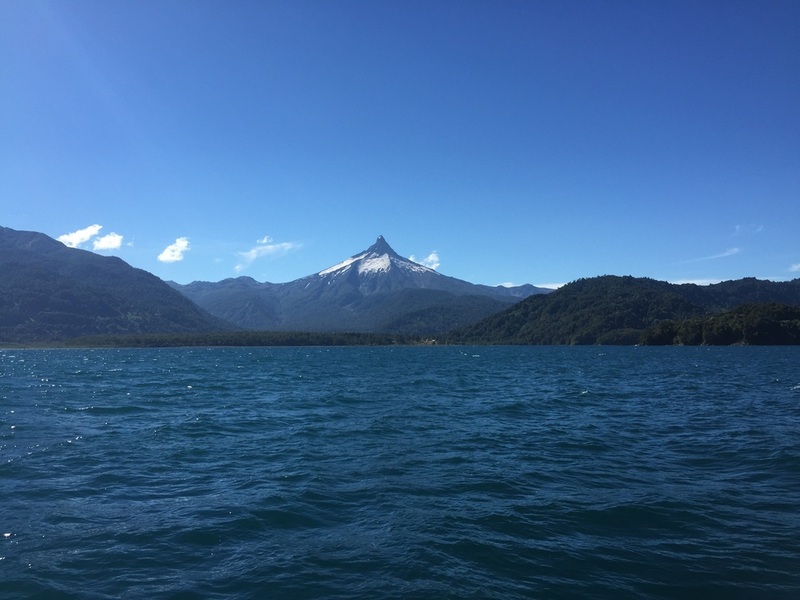 This day long journey takes me through two national Andean parks, the Pérez Rosales in Chile and the Nahuel Huapi in Argentina as I “sail” through the Andes through lakes and rivers, to Puerto Varas. This Chilean town also appears to be more at home in Germany and I'll spend a day there exploring the city's unique architecture and beautiful surrounds before boarding a flight from neighboring Puerto Montt to Puenta Arenas, the southernmost city on the South American continent! 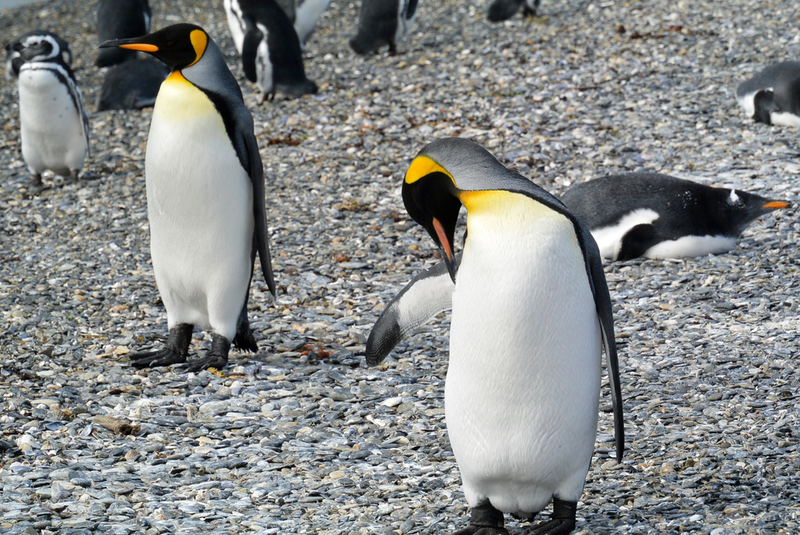 Punta Arenas, Patagonia's largest city, is located on the Strait of Magellan, will be my base of operations to see Penguins (and baby Penguins) at the Monumento Natural Los Pingüinos and Pingüinera Seno Otway, as well as many other natural wonders and historic sights related to Magellan's journey around the world. So you would think after going to the end of the world, I would be done with my trip...but no! After flying back up to Buenos Ares, I'm going to keep going north and into the Jungle, for a two day visit to Iguazu Falls, one of the seven natural wonders of the world. I originally wasn't planning on going here, but every person I talked to about Argentina told me I would regret not going. So now I am! While this sounds like a totally planned trip, there's plenty of things to still figure out. For example, how will I cross the Andes? Where will I stay? How will I get from Punta Arenas to Ushuaia? What should I pack for a trip to the very deep south? These topics and many more will be explored over the next few weeks, so climb on explorers!